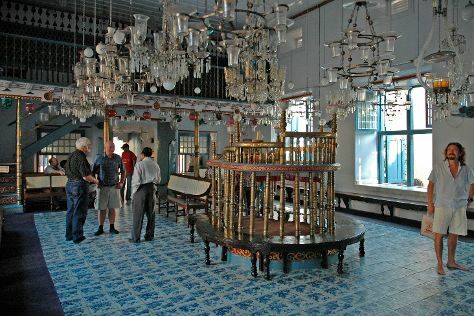 Kick off your visit on the 13th (Sat): take in the spiritual surroundings of Paradesi Synagogue and then make a trip to Chinese Fishing Nets. To find ratings, maps, reviews, and tourist information, you can read our Kochi (Cochin) trip builder website . Muscat, Oman to Kochi (Cochin) is an approximately 4.5-hour combination of flight, taxi, and subway. You can also do a combination of flight, taxi, and train; or drive. The time zone difference when traveling from Muscat to Kochi (Cochin) is 1 hour. Traveling from Muscat in October, things will get little chillier in Kochi (Cochin): highs are around 36°C and lows about 28°C. Finish your sightseeing early on the 14th (Sun) to allow enough time to travel to Kovalam. On the 15th (Mon), enjoy the sand and surf at Lighthouse Beach, then enjoy the sand and surf at Kovalam Beach, then admire the landmark architecture of Sree Padmanabhaswamy Temple, and finally make a trip to Pazhavangadi Ganapathy Temple. To see maps, traveler tips, other places to visit, and tourist information, you can read our Kovalam trip planning tool . Do a combination of taxi and flight from Kochi (Cochin) to Kovalam in 1.5 hours. Alternatively, you can drive; or do a combination of train and taxi. In October, daytime highs in Kovalam are 36°C, while nighttime lows are 28°C. Finish up your sightseeing early on the 15th (Mon) so you can travel to Munnar. Sitting at the point where three mountain rivers meet, the hill station of Munnar has become known as a tea-growing center in the south of the country. On the 16th (Tue), see the interesting displays at Tea Museum, pause for some serene contemplation at C.S.I Christ Church, then admire the natural beauty at Tea Gardens, and finally see human ingenuity at work at Mattupetty Dam. For traveler tips, reviews, ratings, and other tourist information, read our Munnar attractions planning site . Getting from Kovalam to Munnar by combination of taxi and flight takes about 3 hours. Other options: do a combination of taxi and bus; or drive. In October in Munnar, expect temperatures between 36°C during the day and 28°C at night. Finish your sightseeing early on the 16th (Tue) so you can travel back home.